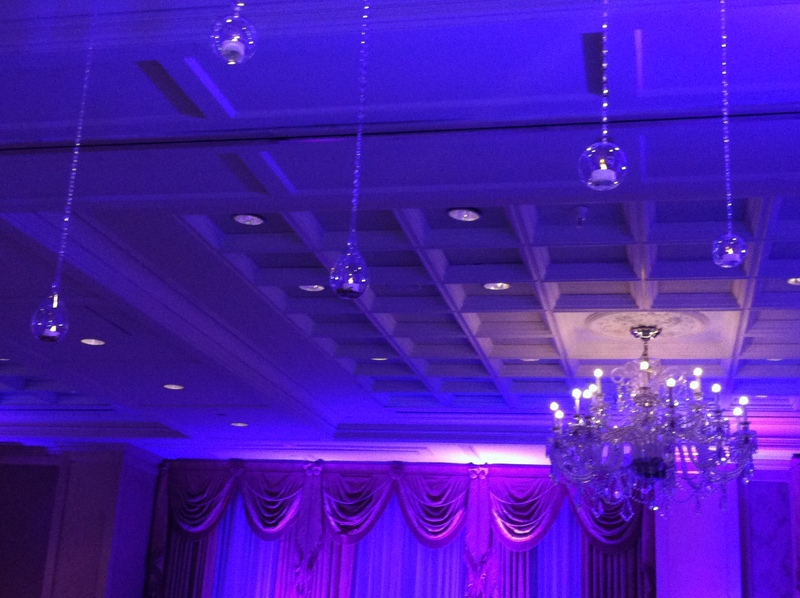 Congratulations to Amber and Elana on their beautiful wedding at the Townsend Hotel. The couple currently lives in New York but has close family ties here in Michigan and choose to hold their wedding ceremony at the elegant hotel located in the heart of Birmingham. Both Amber and Elana had a processional of their own with the songs “Can’t Help Falling in Love” and “Somewhere Over the Rainbow”. Following the pronouncement, we played “Simon Tov” and the guests enthusiastically joined in. We then played the cocktail hour and enjoyed several of the guests who made requests or just stood by and sang along. It was a lovely night for two beautiful people in love. Best wishes! It was an elegant affair. From the pew lanterns at the church to the suspended tea lights over the dance floor to the dining tables named after famous golf courses, John and Jennifer created a romantic evening reminiscent of a timeless classic. We couldn’t help but take several pictures of the beautiful Townsend Hotel in Birmingham decked out for their cocktail hour and reception. 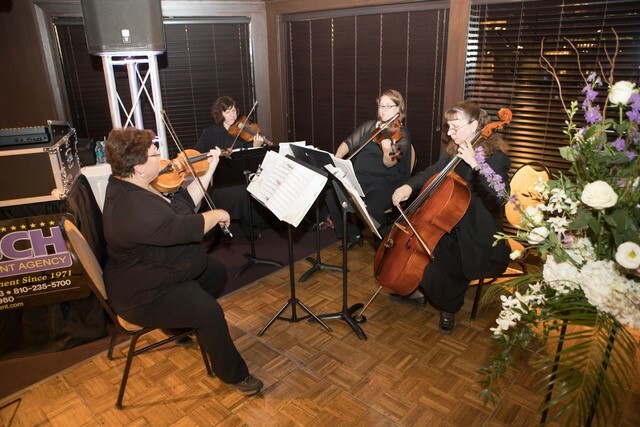 We were able to showcase our talents with classical music for the wedding ceremony, held at First United Methodist of Birmingham, followed by contemporary and nostalgic music for their cocktail hour. We received many comments about our Beatles arrangements and as always, The Game of Thrones theme song is a big hit. We’ve added several new songs to our repertoire including Smoke on the Water by Deep Purple and Such Great Heights by Postal Service. We premiered them here and both were well received by the guests. Jennifer and John gifted their guests with a beautiful evening. 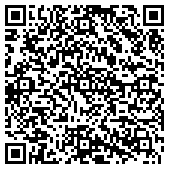 We always appreciate being entrusted with the honor of providing the music for a couple’s ceremony. This was a delightful event for us and we send John and Jennifer our very best wishes. Congratulations to Amanda and Evan on their wedding last week at the Birmingham Community House. 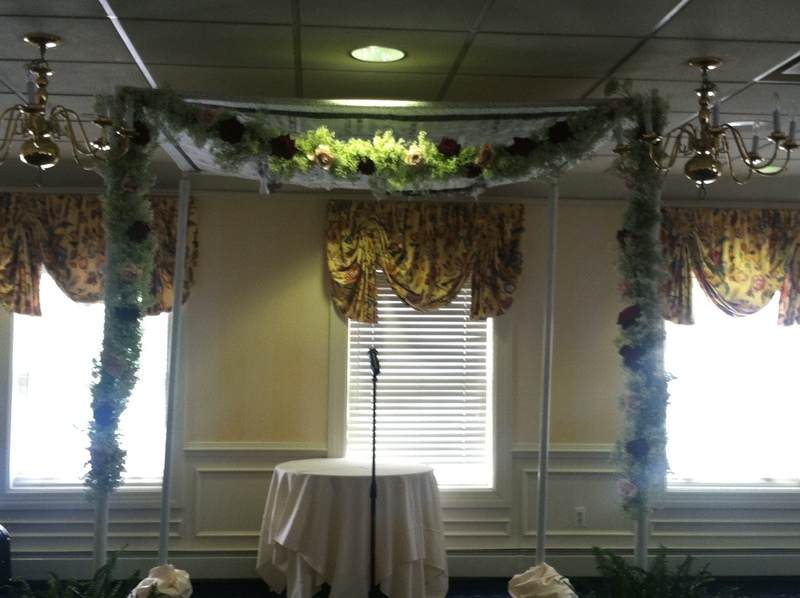 The couple chose to have the wedding upstairs and it was a beautifully appointed room accented by their chuppah. 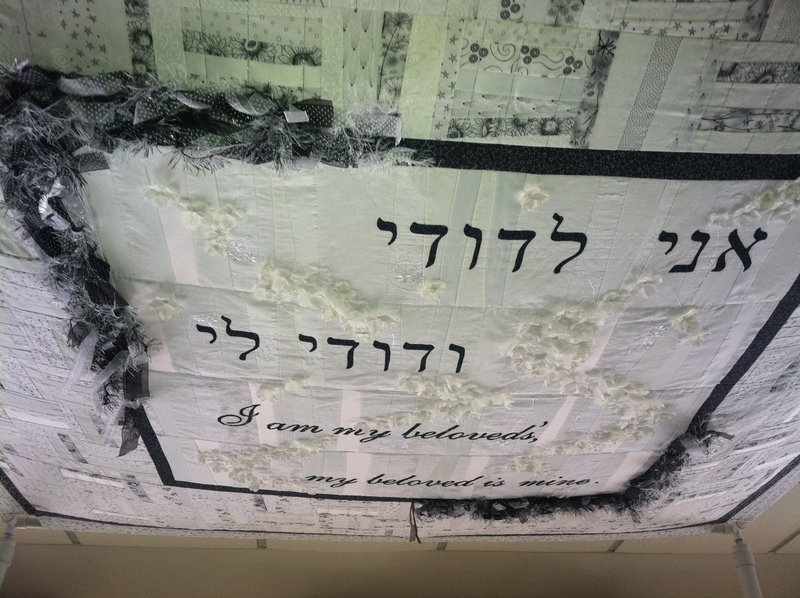 As the picture shows, there was a gorgeous wall hanging stitched with the famous quote, “I am beloved and my beloved is mine” that served as the canopy. What a treasure for their home! Miriam Jerris conducted the ceremony and shared the couple’s story with the guests. It was fascinating and a testimony to the power of Scrabble! For music, they chose romantic nostalgic songs such as “The Way You Look Tonight”, “Someone to Watch over Me” and “I Will” by the Beatles. The families and bridal party processed to “No Surprises” by Radiohead while Amanda chose to process to “Till There Was You” from the musical, Music Man. They created quite a surprise with lots of laughter for their guests when chose “The Simpson’s Theme” for their recessional. This fun loving couple is off to a great start and we send them our best wishes. Congratulations to Suzanne and Christopher who were married last week at the Birmingham Community House in a lovely outdoor wedding under the tent. The Reverend O’Grady, a long time friend of our quartet, officiated and his wife Lucy coordinated the wedding party with their usual efficiency and grace. Suzanne and Christopher chose the traditional pieces of Bridal Chorus and Wedding March along with Kanon in D and Jesu for ceremony music. The cocktail hour was held at the elegant Townsend Hotel across the park from the community house. Here, we had the fun of playing Beatles, Journey, Coldplay and MoTown. Suzanne and Christopher requested a special song, “My Life” by the Beatles which we were able to play for them. The guests were very receptive and we received many lovely compliments. Congratulations again to Suzanne and Christopher! Congratulations to Susan and Ryan on their wedding and reception at The Reserve in Birmingham. This elegant destination is a fairly new banquet center from the people who run Big Rock Chop and Brew House on Eton. Commissioned artwork and a blown-glass chandelier decorate the lobby. Large windows, vaulted ceilings, mahogany wood, and a granite fireplace were chosen for their residential feel. 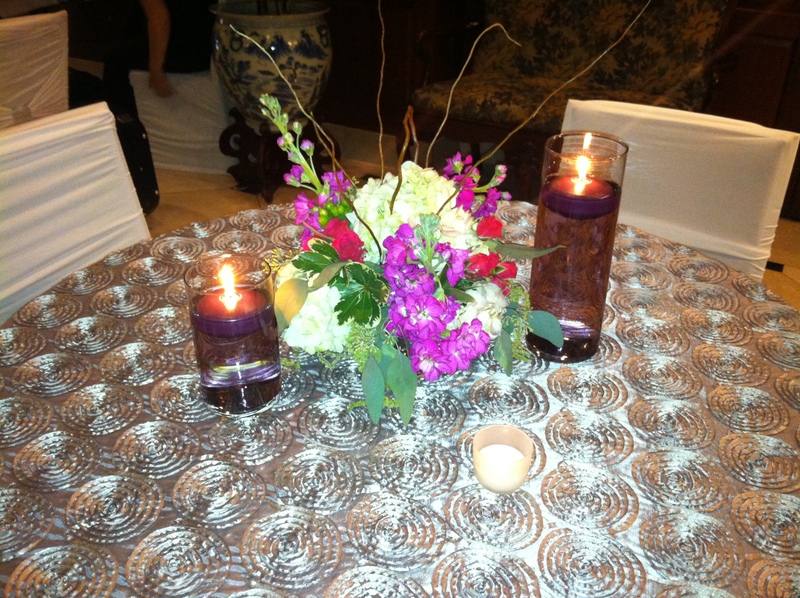 Nicole from Emerald City Designs coordinated the event and created a fabulous evening. 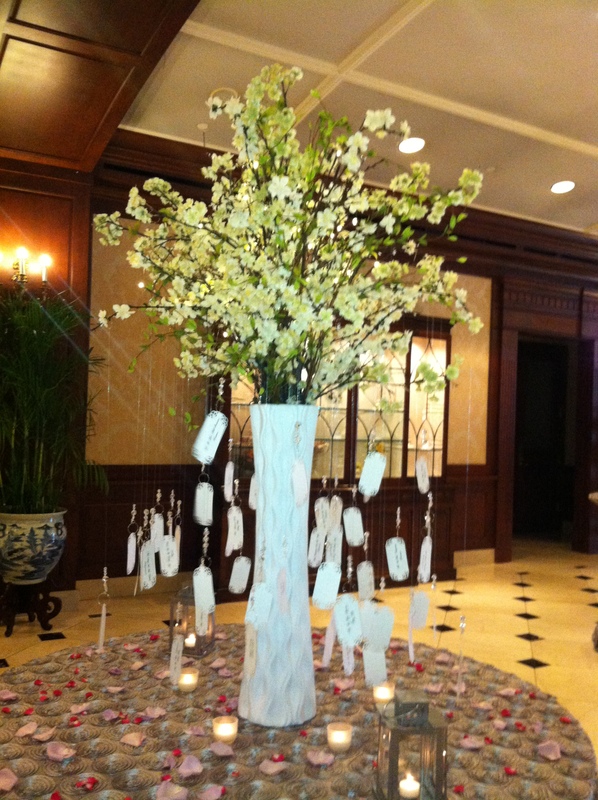 Of special note were the flowers used on the chuppah and in the dining room. The arrangements of white roses and hydrangeas were stunning! The silver and white combination used throughout the evening communicated classic elegance. 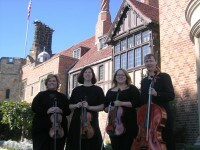 We had the pleasure of playing all classical music for the ceremony and a mix of styles for the cocktail hour. The family and bridal party processed to “Air” from Handel’s Watermusic while Susan, in a gorgeous gown with silver detailing, processed to the well known Pachelbel’s Canon. We wish Susan and Ryan the very best as they begin their life together. Congratulations to Julie and John! They were married at the Holy Name Church in Birmingham. (http://www.hnchurch.org/) Thank-you to Norah Duncan, the church organist. We were pleased to play the recessional together. It was a traditional Catholic service. We enjoyed working with such an organized bride. Everything was beautiful! Congratulations to Nicole and David! They were married at the First Methodist Church in Birmingham (http://www.fumcbirmingham.org/aspcms/default.aspx). Thank-you to the Pastor and the coordinator for all of their help. Thank-you also to Mr. Tisdel for lending his beautiful voice!